The Westerners were beaten by six points but racked up four tries in the process. Alex Bywater reports from Cardiff Arms Park. 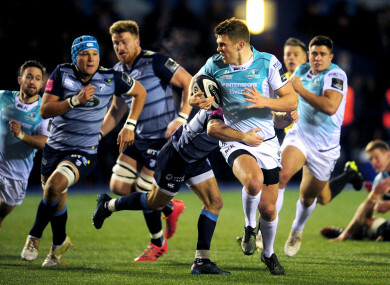 CONNACHT SUFFERED THEIR second defeat of the season to Cardiff Blues as they were beaten 36-30 in a thrilling yet error-strewn game in the Welsh capital. The Irish raiders claimed two losing bonus points through Niyi Adeolokun, a Shane Delahunt brace and captain John Muldoon’s late score, but paid the price for Eoin Griffin’s second-half yellow card. Welsh region Blues came out on top thanks to Olly Robinson, Matthew Morgan and Owen Lane, jumping above their opposition in Conference A in the process. Jarrod Evans and his replacement Gareth Anscombe also kicked valuable points for the home side. Connacht lost flanker Eoin McKeon to a hamstring injury in the warm-up. Eoghan Masterson stepped up from the bench, but Kieran Keane’s side started well. Tom Farrell was a lively presence in midfield and following a scrum surge, Jack Carty opened the scoring with a simple penalty. The Blues soon hit back, Evans kicked a penalty before strong carries from Macauley Cook and Nick Williams allowed Robinson to dive over in the left corner. Evans nailed the tricky extras. Connacht had turned down an early chance of three points, instead kicking to the corner and losing the line-out. It proved to be a poor decision and Evans’ second penalty made it 13-3. At that stage the visitors were struggling, but they were then gifted a way back into the game. Willis Halaholo’s misguided pass in midfield was picked off by Adeolokun and the winger raced away for a simple finish. Carty converted and then exchanged penalties with Evans as Connacht went into the break 16-13 behind. On his Guinness PRO14 debut, referee Craig Evans had been unpopular with the home fans in a first half which while entertaining, saw both teams make a series of mistakes. Connacht started the second half on the front foot and their scrum was well on top. But with a set piece on their Cardiff line, the home side were awarded a surprise penalty. The Blues cleared and when Griffin was yellow carded for a deliberate knock-on – given via the TMO – the hosts were given a numerical advantage. Morgan soon made the most of it by diving over following a scrum, Anscombe converting for the game’s crucial score. Anscombe then had a try ruled out for a block by Williams, and while Delahunt’s first following a driving line-out set-up a tight final quarter, Connacht never quite got ahead. Anscombe set up a fine finish from young wing Lane off another set-piece and the Wales pivot’s conversion put his team out of sight. Williams’ yellow card for an off-the-ball skirmish meant Blues went down to 14 for the final 10. It allowed Delahunt over for his second of the day but by then, it was too little, too late. Anscombe nailed two late penalties to seal the home win, although Muldoon did dive over in the final few minutes as Connacht, in front of watching former coach Pat Lam, went home with something to show for their efforts. Email “Error-strewn but absorbing as Connacht go down to bonus-points defeat in Cardiff ”. Feedback on “Error-strewn but absorbing as Connacht go down to bonus-points defeat in Cardiff ”.